I did pick up a coir mat to cut up for terrain. That counts as dead right? Dead cropland? 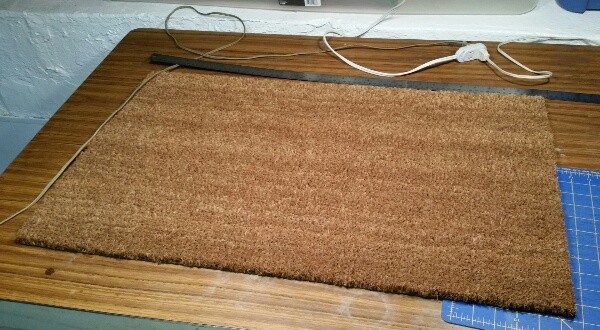 A few years ago when I was initially looking it was impossible to find these coir mats without any graphics or designs. I have no idea why that would be, but I couldn't find plain ones anywhere. I eventually bought one with a decorative border and cut it up to make use of the plain parts of it. Last week, I happened to notice these at the local Home Despot store and grabbed one. I should have got a bunch of them, for extensive croplands. Maybe after the holidays, if they still have them. 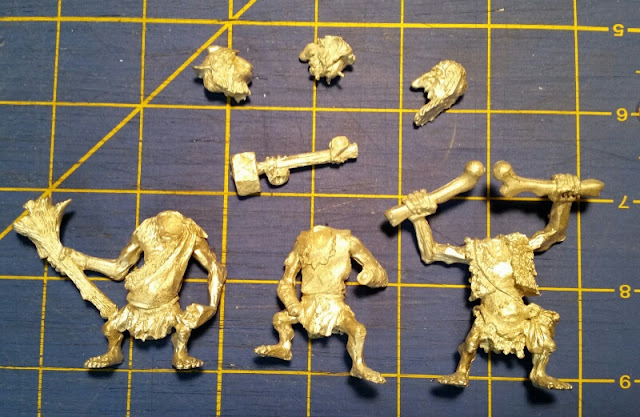 I received a set of trolls from Drew Williams yesterday. Beautiful figures! I've also been rejobulated. I started a new job last week. It's a positive thing, though it was a difficult choice to leave what I had been doing. No time to paint currently. I hope to work painting (and gaming!?) back into the new schedule. I'm back in the land of architecture. Congrats on the new job. We're still waiting to see whats up with my wife's work and I'm still trying to consider how best to reintegrate into working society as my kids get older. IKEA is a great source for those types of mats on the cheap, if you have one near you. I bought one a couple of years ago and then let it sit there. I also need to try and figure out why your blog isn't coming up in my feed reader. Ikea's about two hours away. I've made a few trips out there, but a bit out of the way for regular shopping. Our big adjustment is that both my wife and I are working full time & outside the house now, so we're already running into some bumps with that. It's taking a bit of juggling just to manage the regular stuff. The next few weeks will be rough, as I'm in a probationary period (or whatever you would call it) and only have two days off for the holidays -- but our daughter's school *and* after school program are shut down for more than two weeks. Congratulations on the new job! Hope it does not take away too much time... and it may even scratch some creative itches for you. Thanks. Rather than scratching a creative itch, I think it's scratching an equally important itch for work that's in my realm of expertise, yet challenging. Unfortunately it is making it hard to manage free time. But we'll see how that goes once the dust of the schedule change (which impacts the whole family) and holidays settles. Yes, good luck with the new job! I hope that things settle down soon and we see more of your painting. You don't want to anger the restless dead.